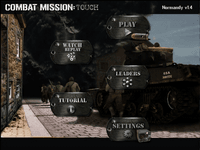 "Combat Mission: Touch" allows you to command American and German troops during and after the invasion of Normandy, June 1944! It mixes fun and realism for a unique, hands-on, 3D wargame experience. "Combat Mission: Touch" is the result of a collaboration between Battlefront.com, the critically acclaimed creators of the genre defining Combat Mission series of wargames for now over 10 years, and Dromedary LLC. Using Combat Mission's unique WeGo turn-based play mode of simultaneous planning and execution phases, and a vast 3D environment, it combines the fun of fast paced action with the strategy of turns. Make no mistake, fun as it is, "Combat Mission: Touch" is a true wargame, with a number of mind-blowing features that were available, until now, only on the desktop.